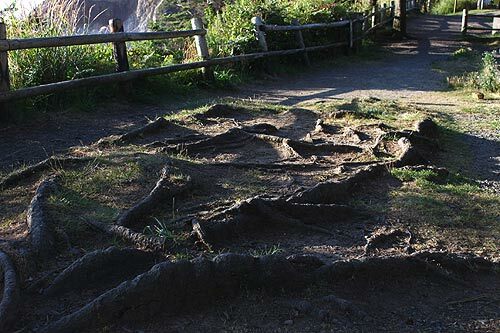 Not far south of MP 32 â€“ perhaps two miles from Cannon Beach - this tree-smothered parking lot appears. 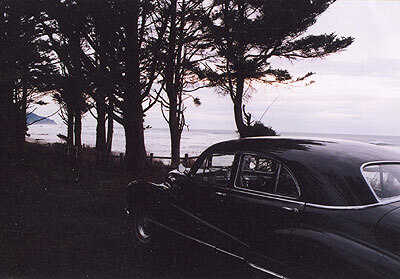 Called Arcadia Beach State Recreation Site, it's sometimes known incorectly as Arcadia Beach State Park. 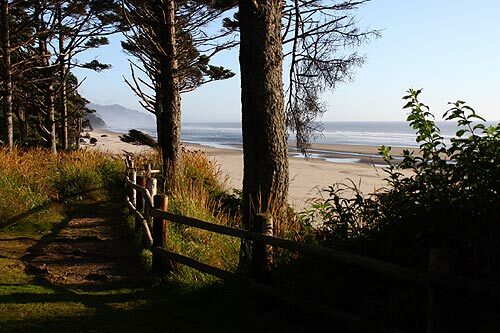 Take the small path down and you’ll find a sandy beach covered in cobblestones near the tide line, as well as cliffs and rock structures that some have whimsically claimed look like a dragon and its young turned to stone. In the bottom photo: Is this an historical photo? No. But this wondrous spot is leant an ancient vibe with the presence of this dignified, elderly machine. At the bottom: video of Arcadia Beach and an unusual sunset effect. More on this Weekend of Rare Oregon Coast Science: Novaya Zemlya Effect, Glowing Sand.